Republican presidential candidates skipping La Raza convention. 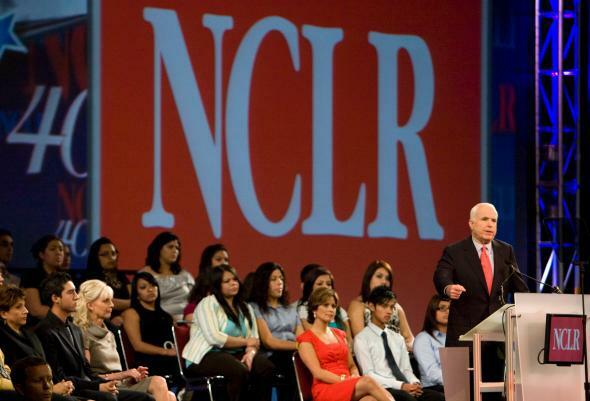 John McCain at the National Council of La Raza’s convention in July 2008. The nation’s largest Latino advocacy group says it invited every presidential candidate to annual convention next week. Not a single Republican plans to attend, a spokesman said. Democrats Hillary Clinton, the former secretary of state, and Martin O’Malley, former governor of Maryland, will appear at a lunch Monday in Kansas City, Mo., before the National Council of La Raza, an advocacy and civil rights organization for Latinos. Democratic Sen. Bernie Sanders of Vermont originally had a conflict but now plans to appear as well, his spokesman said. Ben Carson was the only GOP candidate to appear at a gathering held last month in Las Vegas by the National Association of Latino Elected and Appointed Officials, another influential group.